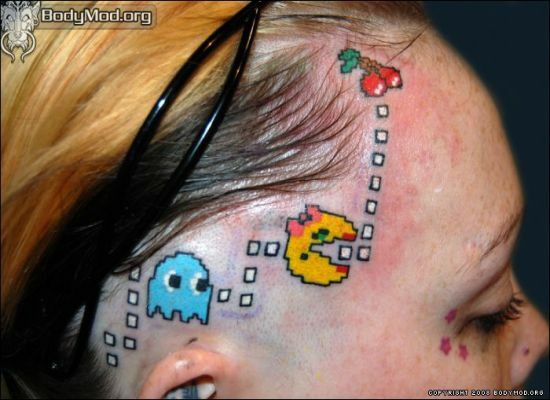 Home Off Beat	Geeky Ms. Pacman Head Tattoo-Gamers go wild! Here meet a geeky goodie and a tattoo fanatic who got Ms Pacman inked on her the side of their head. Aileen Fritz, the proud owner of classic Ms. Pacman tattoo. A cool tat with cherry power-up while being chased by a blue ghost-starts right above the ear and ends above the eyebrow. Nice work of art. Ainât it? Wanna know what Aileen says about the tat? Head tattoos are THE S**T!!!!!! LOL. So I was workin yesterday and we decided to tattoo me cause well, it was slow.. A few ideas were thrown around and Ms Pacman WON!! So now I am the proud owner of an ultra geeky head tattoo!!!! Not sure if life gets any better. God only knows which tattoo she will come up with next. Will it be ‘Pacman to the rescue’ tattoo on the other side of her head? I have no idea about it. Letâs wait till she surprises us with something new. ← Incredible tattoo- Ghastly or bizarre?